Got out into the river on and around Joppa flats (with the boat) this AM for some better than fair action. Fished 3 hours before high and 3 after. Between the two of us we boated over a 100 fish. OK, half of that were micros but the rest ranged from low 20’s up to several keeper sized fish. Biggest was 37″ by Jay. We actually got into an awesome pod of big fish quite early but it don’t take long for the eyes of the neighbors to overtake your drift as well as have your drift and big fish drag you out to sea once and a while. All fish were caught on sluggos and flies (clousers and deceivers). Almost all fish were on the surface. Lost my hottest producing clouser to a micro at the boat. DOH! That should teach me to retie (I hope). Before high-tide, we had several sightings of monster sized fish COMING COMPLETELY OUT OF THE WATER!!!!! Usually the big fish don’t need to do that right? Wow, what a sight. Was out in front of the beaches near the mouth and saw some diving birds (but caught no fish under them). NEWS FLASH – I got my 1st keeper sized fish on a fly rod today. 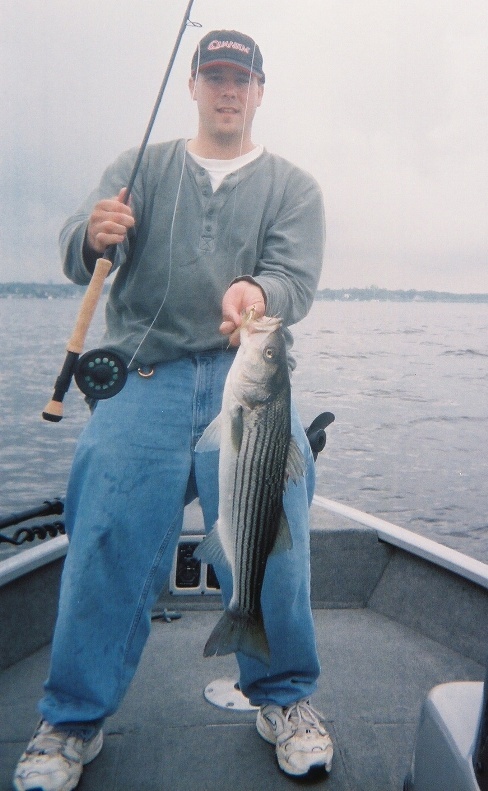 Actually got my 1st striper on a fly today. Wow, was that fun. I think that one was only 28″ on the nose but was admittedly more fun than even my biggest fish caught on light tackle freshwater setup with 10 pound line (was a 39″ btw for those that are wondering). 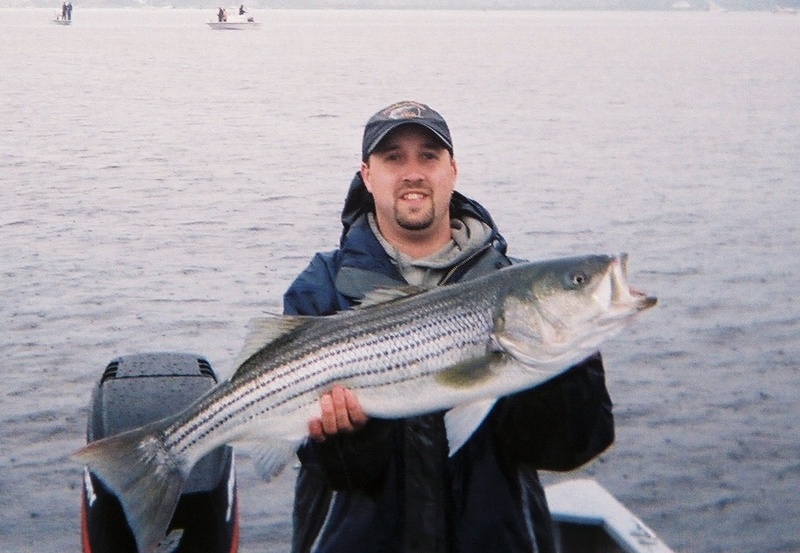 I’m tired, have striper thumbs, and all I can think of right now is…….. I need to do that again as soon as possible. 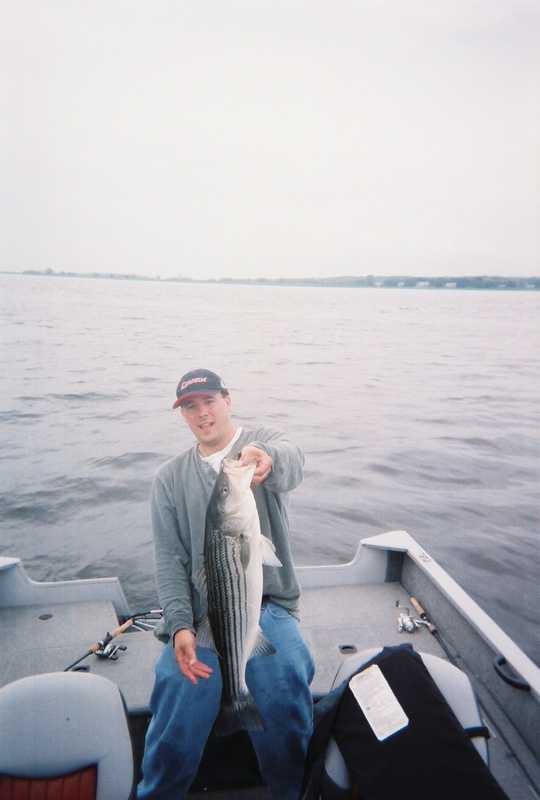 This entry was posted on	June 25, 2006 at 1:57 am	and is filed under Saltwater Fishing Trips.